This session has openings. Registration for this session will end on 7/15/2019 at 5:00 PM. This is a great introduction to working with and riding horses at the Camp Lookout Barn--there is no previous experience needed! 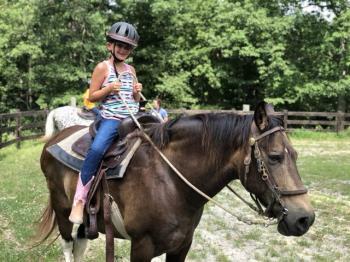 Because our horseback program focuses on building a relationship between horse and camper, campers will learn basic riding skills as well as get a taste of what it is like to own a horse. Horseback Sampler (Grade 4) begins Monday 9:00 – 10:00 a.m. and ends Friday with a 2:00 p.m. closing.